It’s hard to imagine that you would forget one of the most special days of your life, but the truth is, memories do fade over time. With the help of a wedding album, you can be reminded of all those special moments 10, 20, or 50 years from now. Imagine years from now being snuggled up with your grandchildren, or sitting with family and having something tangible to look through and enjoy the story of your wedding day. Sure you may have framed photos throughout your home, but those photos only provide a glimpse into one specific moment. A wedding album can be organized to reflect the timeline of the day, and tell a much bigger story. A story with details, and those moments caught in-between. 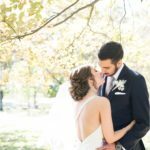 Most may not think that far ahead when they’re planning their wedding, but wedding albums make for wonderful heirlooms to pass down from one generation to another. It’s just another way to contribute to your family history. In the end, wedding albums are simply timeless and can preserve memories for many years to come. This is a real wedding album designed by your’s truly, for Alan & Brooke. To see more photos of Brooke and Alan’s gorgeous backyard spring wedding, checkout their blog post HERE.